It's still Winter but Spring isn't too far away and we're making room for new items with our Winter Clearance Sale. We are offering a "Buy One, Get One FREE" on RUNATL! Purchase any regularly priced Long Sleeve or Hoodie and get a FREE Singlet, Tank, or Short Sleeve RUNATL shirt. Purchase any regular priced 1/4 Zip or Full Zip Hoodie and get a Long Sleeve for FREE! All Winter Apparel is also marked down 40%. This sale runs through February 28th. Rush down to your nearest Big Peach Running Co. location before the best selection is all gone! Valentine's Day is almost here. 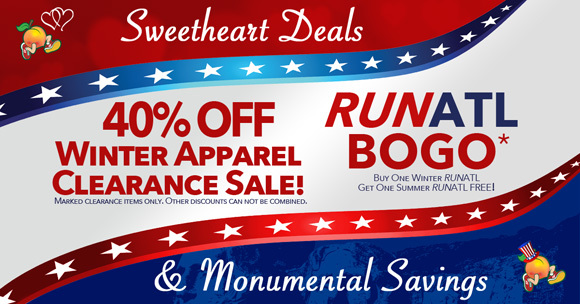 Show your special runner some running love with a new outfit, some socks, or even some fresh kicks. When in doubt, a BPRC Gift Card is one size fits all! Visit any of our 7 Big Peach Running Co. locations or shop online. This week on the RUNATL Podcast Mike & D2 sit down with Dave DeBoer, Ragnar Director of Trail Operations to talk about the upcoming Ragnar Trail Relay in Atlanta and what it takes to build an actual village for this event! More details and show notes are available here. We invite you to subscribe on iTunes, SoundCloud.com, or whatever RSS Podcast App you choose. Seated postures, especially computer & driving postures, can lead to neck, shoulder pain, and lower back pain. Our friends from Excellence in Exercise will be on hand to demonstrate self-myofascial release to improve mobility & flexibility that will prevent and treat the pain caused by improper posture. RSVP here. Here is a list of upcoming store group runs. Check out our full social run schedule. There's always fun on the run for everyone. Midtown - Friday, February 8th: Kick off the weekend with the Midtown Crew and Mizuno at Eventide Brewery! Meet at 6:30 pm and depart at 7:00 pm for a 5K run with a post-run adult beverage at Eventide Brewery. RSVP here. Decatur - Tuesday, February 12th: Come on out and join our regular group run and demo Saucony shoes! We'll have the Triumph, Guide, Ride, Freedom & the brand new Kinvara. RSVP here. Alpharetta - Monday, February 18th: Our fun and friendly Rep from Balega & Trigger Point will be at the group run with some sock giveaways and Trigger Point & RockTape demonstrations! RSVP here. Alpharetta - Wednesday, February 20th: Dr. Joel Eaby of North Point Physical Therapy will join us for the group run and present various exercises and stretches to strengthen your feet. RSVP here. All group runs begin at 6:30 pm unless otherwise noted. The Spring Marathon Training Series continues at our Midtown location so come join us! On Saturday, February 9th, our friendly New Balance Rep., Alex, will join us with some demo shoes and some tasty post-run treats. Arrive by 7:00 am to allow time to park in the area. Run starts at 7:30 am. RSVP here. Did someone say PANCAKES?! Come on out to our Alpharetta location for a group run and then fuel back up with some pancakes courtesy of Kelly Scott of Ty J. Young Inc. Wealth Management. Our Alpharetta team will be leading a group run at Haw Creek Park with our friends from On Running. They'll have the Cloudventure, a lightweight trail shoe for you to demo on these relatively flat and beginner friendly trails. After the run, fuel back up with some coffee and donuts courtesy of On Running! RSVP here! Whether you’ve already signed up or are interested in Ragnar Trail – Atlanta, or simply wish to run some trails, join us at the Georgia International Horse Park as we run on parts of the 1996 Olympic Mountain Bike course. The preview course is perfect for beginners with very little elevation change and will consist of the “Green” and “Yellow” loops. This is a FREE EVENT! After the run, cool down and relax with a yoga session by Empower Yoga and enjoy Hydration/Nutrition & Trail 101 Clinics. Big Peach On Wheels will also be on site for your convenience. We'll also have some raffles and giveaways for participants! RSVP here. Run with us and do some good for the community! Our Midtown location is hosting a fun run from our store with a 4.4-mile run to Armour Drive where runners will help pack meals. Open Hand prepares, packs and delivers over 6,000 healthy meals each day throughout metro-Atlanta for those who might otherwise go without including low-income men, women, and children who are dealing with a critical, chronic, or terminal disease; and homebound seniors. After our shift, we'll run back to the store. If you'd rather not run and just volunteer, the hours are from 8:45 am - 12:10 pm. Join us as we represent RUNATL and our mission to support the community! Please read the dress code requirements when you sign up. We'll make accommodations for you as well. Sign up for the remaining 6 spots here! The basic principles of TransFORMed Running are Posture, Lean, and Landing. Learning these principles will help transform your running into a more efficient & injury free experience! Perfect for runners of all paces and abilities. Run as a "single" (And mingle if you'd like!) or as a "couple" and run with that special someone - husband, wife, boyfriend, girlfriend, son/daughter, etc.! All finishers get chocolates, free entry into the post-party, heart-shaped finisher medals, awesome shirt and more! Register online. Is 2019 your year for adventure or you like the idea of something new? Then gather a group of your friends and sign up for good times on some nice trails. Ragnar Trail Atlanta-GA is back where teams of 8 (or 4) set out to conquer a series of three smooth single-track trails that start and finish at Ragnar Village. Use code: BPRC19 to save $80 off team registration & also beat the price increase on Feb. 6th!